Possibly your LAST CHANCE At Almost $1000 USD getting 75K AMEX Points! Click HERE to apply for the Business Platinum and Earn 75K Welcome Bonus Points! American Express Canada has put us on notice that after March 21st, they will be changing their referral program. 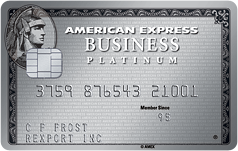 Instead of getting 25K AMEX points for referring someone to the AMEX Platinum Business, the Gold Business, or the Platinum personal card, it will likely drop to either 10K or 15K points based on information I've obtained. If you think that means the welcome bonus for the person applying will stay intact, think again. It MIGHT, but 75K points is a very high welcome bonus. After meeting the $5K spending threshold in 3 months, that's 81250 Membership Rewards points!! If one sold their points to someone, it's worth almost $1K USD. One could use the points to offset the cost of the card (annual fee is $499 now) and still walk away with over $600USD, Starwood and Marriott Gold, concierge service, new Priority Pass lounge access, 1.25 points per dollar spent (instead of 1 point per dollar), and so much more. Considering the bonus on the personal platinum card is 60K upon referral, and that card has a much higher annual fee, it only makes sense the bonus on the business platinum could fall too. You can use your points for cash by selling them, transfer them into SPG points, and then at triple their value to Marriott points! If you need any help with any of this, feel free to contact me at thepianomanii@hotmail.com and I'll walk you through it all and help you use your points to best meet your vacation goals! Apply today, and I would much appreciate you using my referral link above. It's not as simple as it sounds. Personally, it's not for me as it's not a regular voice line, it's a VOIP line from one provider and a data plan from another, but if you don't mind putting in the effort, you don't travel out of the country much, it will save you a bundle. An acquaintance of mine, Zecharia, put me onto this--and I thank him for it! Fido is currently offering a data plan with 3 Gigs of data if you bring your own tablet. It's meant to be used for tablets, but there's no reason why the SIM card couldn't be put in a cell phone. Only thing is, you need to bring your own phone into the plan and know you won't have a traditional cell phone line. You will get your cell phone line from a Fongo.com, VOIP provider. They will charge $10 for 6 months of unlimited texts, so $20 a year. Other than that, porting your number over will cost you a small fee. The reason you may want to pay for this is many don't have wifi/data text apps such as WhatsApp, and you may need to be available to receive regular text messages. Total cost is $15 a month for Fido, $20 a year for text messages= yearly cost of $200! If you travel to the States, you'll want to get a different provider as the SIM card from Fido won't give you data in the States. Roam Mobility offers SIM cards for around $10, and with it, you can get data only for $9.95 for 3 days, or a regular phone line with text and data if you wish as well, starting at around $5 a day. MEDIUM HOT! ;) Hyatt Resort, 3 Bdrm Resort Suite for $117USD! The Hyatt Spirit Ridge Resort in one of the only deserts in Canada, Osoyoos, BC (a few minutes from the US border, about 1hr40min. from Kelowna in the Okanagan Valley, is offering 3 bedroom suites with two king and two queen beds plus a pull out, 3 bathrooms, a full kitchen, washer/dryer, fireplace, a living area with a dining room and balcony (1300 sq. ft) for two periods (not optimal for many, mind you): October 1-30 and December 1-30. It's near a private beach in Osoyoos Lake, has a full service spa, local vineyards (though again, the dates are not best for this), and other attractions. For a family of 6, the price jumps to just over $150USD. It includes all fees. Click HERE to see the deal on Booking.com! AMEX Canada is offering bonus AMEX points when booking through the AMEX Travel website. If you book a short haul flight (YYZ to NYC), you're looking at 15K points MINUS 5K that will be given as a bonus back later, plus $128 in taxes (though you could use your points entirely and fly for free, but that's not a great use of points). See below! From March 1 – 31, 2018, earn up to 10,000 points when you book a flight using the Fixed Points Travel Program1. Earn 5,000 bonus points when you redeem between 15,000 and 50,000 points for flights using the Fixed Points Travel Program for destinations such as Canada, U.S., Alaska, Bermuda, Caribbean, Central America, Hawaii and Mexico. Earn 10,000 bonus points when you redeem 60,000 points or more for flights using the Fixed Points Travel Program for destinations such as Europe, Africa, Asia, Australia, New Zealand, Middle East, and South America. They had no availability for the return date I had chosen if I wanted to fly at the fixed mileage rate of 15K Aeroplan points, so I changed the date to see the final price. They want 15K Aeroplan points PLUS $194.51. At least for this month, using AMEX Travel makes more sense!